Rapnews.co.uk Rapnews.co.uk UK rap, grime and hiphop culture resource! 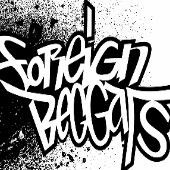 » Blog Archive » Win tickets to Foreign Beggars bash! Win tickets to Foreign Beggars bash! Your chance to get into an invite only Foreign Beggars gig including performances by Focused Few and Double Edge, plus giveaways and free drink! Rapnews has teamed up with Foreign Beggars and Outpost Media to offer our readers the chance of winning a pair of tickets to a fantastic Foreign Beggars bash at Cargo, London on the 22nd of November. The Beggars will be sharing the stage with a very healthy bill including Focused Few and Double Edge, and Casual DJs. The night is invites only, so unless you’re a special person, this is your only chance of getting in! Complementary drinks from Glenfiddich, Maker’s Mark & Courvoisier, plus giveaways from Diesel’s sub brand 55DSL and clothing label FLYR53 will be present. All you gotta do to be in with a chance of being randomly drawn as the lucky winner, is e-mail in the answer to the following question, obviously with your name and contact info (come on guys, that bit isn’t hard!). Get your entry in before the 10th of November and start crossing your fingers. The awesome Asylum Speakers album included many guest appearances, one by rapper Skrein. But what North London collective is Skrein a member of? Don’t forget to read the dope new interview with the Beggars courtesy of John Spiers, and check out the new release ‘Let Go’ featuring Wildchild and Graziella, Dr Syntax and DJ IQ. COMPETITION CLOSED. WINNER: MICHAEL EATON.